When I would tell people I was going to Europe, so many people lit up when I said Portugal was on the itinerary. I had no idea what to expect, having never been. Well I have learned why people love Portugal so much; beautiful beaches, fabulous food and incredibly friendly people. 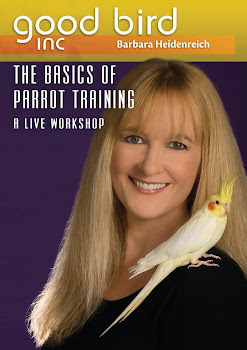 I presented two days of parrot training workshops. The first day was for parrot owners near the city of Lisbon. The second day was for veterinary and zoo professionals in the north of Portugal. I promised I would share some of the highlights of these workshops. A stand out in Lisbon was a wonderful young Cape Parrot. It is not too often you see Cape Parrots. They are an unusual African species with a large beak. Some people say they look they are always smiling. Plus they are sexually dimorphic, which is pretty uncommon for most parrot species. A very unique species indeed. The first thing that was quite obvious about this little fella was that he was very comfortable with new people, new environments and he was also a bit of pig. In other words he had a great attention for treats. 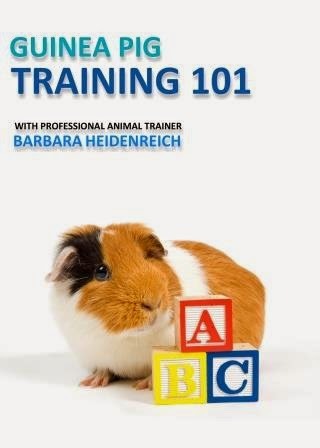 He was the ideal training subject. 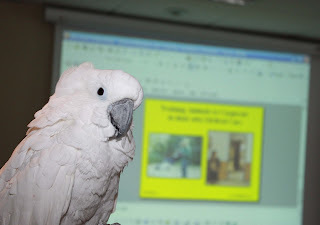 Because he was flighted and a number of people in the room were interested in working with flighted birds, the first thing I worked on was demonstrating how you train a strong recall. 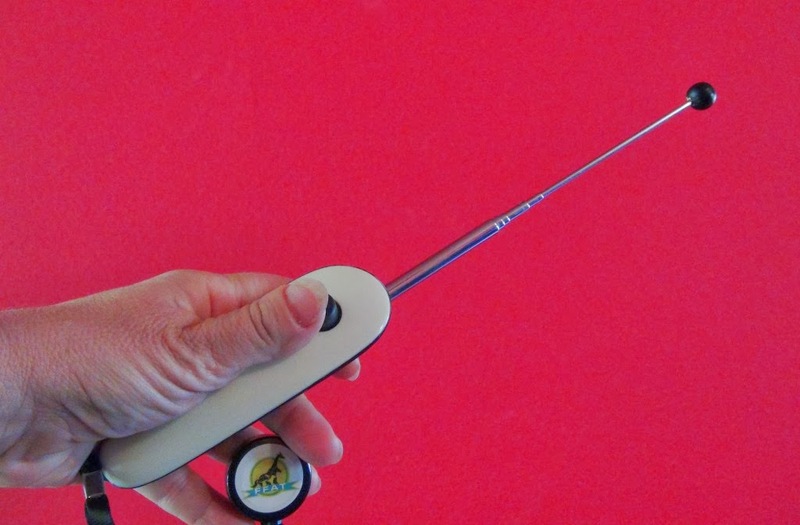 This also included teaching a cue that means fly to a perch. Piece of cake for the Cape Parrot. Throughout the day he continued to show his eagerness to learn. In a matter of minutes he learned to turn around on cue. 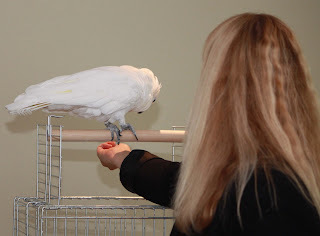 This is always a nice easy behavior for people new to training to try at home with their parrots. The humans learn how to train and the parrots learn how to learn. 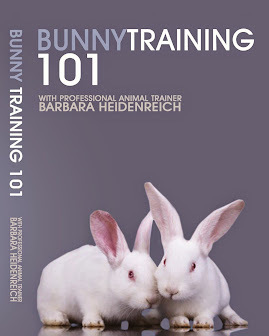 Usually it can be trained in one session, so it is a big confidence booster for everyone. After that I thought I would demonstrate teaching a bird to take liquid from a syringe as we did in France with an Umbrella Cockatoo. I used a straw. The Cape Parrot was a bit nervous of the straw at first. Since he was flighted this was a good lesson in just how slow to go and the subtle signs of fear trainers must respect in order to have success. When we got to the step where he tasted the water, everyone was surprised, especially him! He shook his head and sprayed a few droplets of water around. But fortunately he came back for more despite a bigger approximation than planned. He was certainly a joy to work with and I think we all went home wishing we could add a Cape Parrot to our feathered families. Photos Courtesy of Decio Lopes. I have been in Finland and France teaching some parrot training workshops, and I thought I would share some stories from the road. 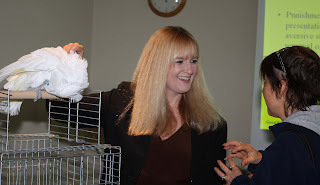 People are invited to bring their birds to my seminars. This has been quite an education for me. Every time I teach I meet 10 or so new parrots. 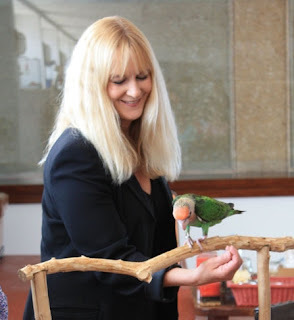 During the seminar I try to find a way to connect with these birds and demonstrate how to teach new behaviors. I never know what will happen or what to expect. Instead I learn to just go with what the bird gives me. This weekend in France I met an umbrella cockatoo. Usually I don’t ask for any background on the birds, but I was told this one was quite shy and nervous and probably would not respond. I had forgotten this by the time I went to see if she wanted to interact. She was sitting quite relaxed and comfy on a perch on top of her transport cage. I offered her a treat. No interest. I then slowly wiggled my fingers near her head to suggest to her I would be delighted to scratch her cute head. Her body language seemed to say she was still comfy so I moved in closer. Pretty soon she was all about the head scratches. 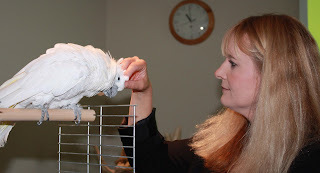 I did a short demonstration on how to use a head scratch as a reinforcer to train a parrot to do something. And the cute cockatoo obliged by taking steps closer to me for more head scratches. I returned to her later in the day and offered some treats. This time she took them readily. So I worked on teaching her to turn around on cue. She was super responsive the next day as well. I then went on to train her to allow a nail file to touch her nail and some foot manipulation. She was still an eager participant. So I decided to train her to take medication from a syringe (for our avian veterinary professionals in the audience.) The cockatoo quickly learned to touch the tip of our home made syringe with just her tongue and take a drop of water. Everyone just fell in love with that cockatoo. On the breaks several people came and interacted with her. She clearly enjoyed their attention. Later I learned she almost did not come to the seminar. There was concern she would be too nervous. They also forgot to tell me “she hates women!” Her caregiver was so happy to see her so calm, and enjoying interacting with so many people…men and women. He really cares for his birds and I think seeing how well positive reinforcement worked for his umbrella cockatoo was really rewarding for him too. Each parrot training workshop seems to have a surprising superstar like this umbrella cockatoo. I must admit I have such fun working birds like her, that I have to remind myself to stop on occasion to make sure the audience gets to take their scheduled breaks. 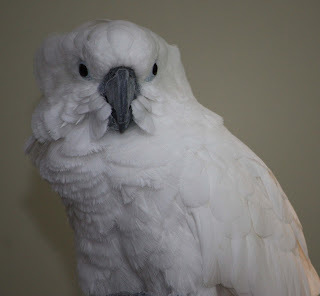 Even though many times I am training the same behaviors, it is always fun for me to try them with a new parrot. It is such a rush when they understand what you want. It is also an honor when they seek your company after a successful interaction. It is all about creating that amazing connection with a parrot. 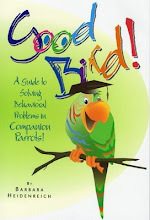 I will share some more superstar parrot stories from my workshops in blogs to come. All photos courtesy of Francois Ducrocq and the Association Europeenne de Perroquet.